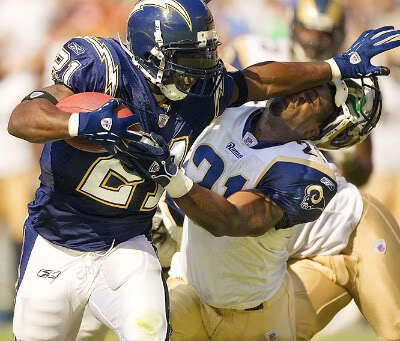 That’s my favorite picture of Ladainian. That’s how I’ll remember him. LT, you are our Man Crush of the Week. I hate that LT is a Jet. Can’t help but cheer for him as an individual though. Yesterday was one of the few times I was happy to cheer for the Jets… because they were playing the Raiders. Loved that LT finished with five receptions for 116 yards and 38 yards rushing on six carries, sad that he lost. His stats though? Just like the Tomlinson of old. You shut down the running game? He’ll burn you catching passes. In that game, LT became just the 3rd player in the history of the NFL to reach the 160 touchdown mark. Pretty amazing. Jerry Rice (208) and Emmitt Smith (175) are the only other two players that have accomplished the feat. Pretty damn good company. Congrats, sir. This entry was posted in Football, Man Crush of the Week and tagged Chargers, emmitt smith, Jerry Rice, Jets, LaDainian Tomlinson, LT, NFL. Bookmark the permalink.